One of our favorite annual village events is coming up in just a week! The Round Lake Area B.E.S.T. 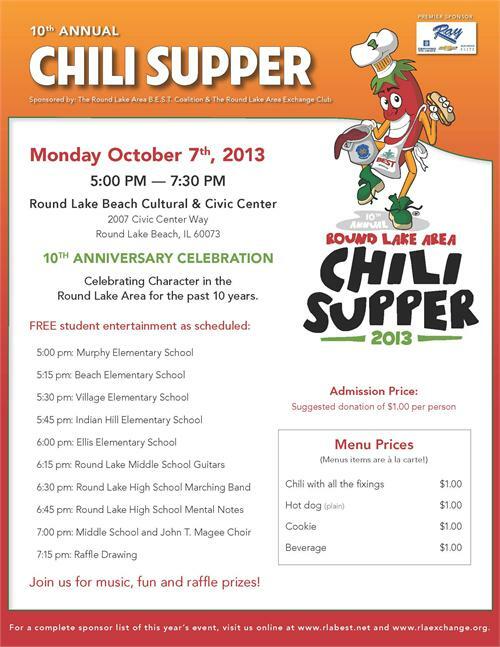 Coalition (Bringing Everyone’s Strengths Together) and the Round Lake Area Exchange Club host their 10th Annual Chili Supper on Monday, Oct. 7th. The event takes place at the Round Lake Beach Cultural & Civic Center, 2007 Civic Center Way, Round Lake Beach. The event is scheduled from 5 to 7:30 p.m.
Each menu item — chili with all the fixings, hot dogs, cookies, and beverages — costs $1. Pay only for items you like; there also will be free student entertainment and raffle prizes. Suggested admission of $1.00; donations will also be taken at the door. This event serves as a major fundraiser for B.E.S.T. to use in the community for various projects throughout the year, so please attend and bring your appetite (and your family)!